When I first got this Lip monthly box I was impressed by the box. I have never been so lucky as to get a stilla product in any subscription box I have received till now. After posting the video on YouTube a family member had pointed me to a review she had read online. You can read that review here. Then I thought to myself It could just be an honest mistake since they were so new I thought I would give them the benefit of the doubt and research more. What I found was not much better and was disheartening. First off the price keeps changing, it started at $20 in March but now its $10. I mean yes it is cool they lowered the price but should it have happened so soon? I was reading over at Make up talk forum about the subscription box, people were having issues from receiving products that appeared to be moldy that the company waved off as breath fresheners, to missing items. Promise after promise the company made were not followed through with and some products (like Mary Kate and Ashley) have been discontinued for years some of the Brands themselves no longer in business. I know its only $10 a month but would you really want to receive old expired makeup in a random box? I don't know how the company can legally get away with doing this. Something else I was upset to find is the parent company of this subscription box. Spicy subscriptions who runs a monthly box for couples. The problem there? Spicy subscription gave us some issues last year. They contacted us to run a giveaway and then to do a review the following month. The giveaway happened, the prize ended up being a bait and switch and not originally what was stated. The review? Never happened. Due to all that we found out about Lip Monthly we do not recommend it to our readers but now you are informed about them and can make your own decision on weather to still go with them. 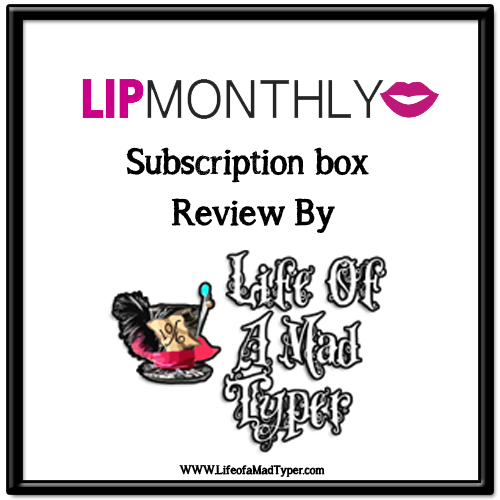 Will you be subscribing to Lip Monthly? Are you already subscribed?? What do you think of the discontinued products? Ive heard about the discontinued products and products from companies no longer in business...however the moldy products I just recently learned about. I was going to subscribe to them but after hearing your review and the research I found myself I will be passing on this subscription box. Hopefully people that do get the box will become informed!